Who Do You Truly Rely On for Your Well-Being? Click here to read a Q&A with the author and download a free chapter from the book. When the Gospel first came to Papua New Guinea, many people were attracted to it because of the material blessings they thought it would bring. They saw the earthly wealth of the “white skins,” and thought that if they adopted the white skins’ religion similar wealth would flow their way. My mother taught at Asaroka Lutheran High School in the New Guinea highlands in the late 1960s, and remembers being impressed by an amiable and intelligent student who appeared to be a committed Christian. Then, after he graduated, he attended university in the capital Port Moresby, and subsequently held a senior position with the Papua New Guinean government as a development planner. Before long, she heard reports that he was going around the New Guinea highlands telling people that the Gospel was not what they needed. Instead, they needed development, which could bring them more blessings than the Gospel ever could. Evidently he had observed that Western culture has more than one God, and had switched his allegiance to the god he thought would be most successful in providing earthly things. Such a transfer of confidence from God to some other provider gets to the heart of what Luther means by idolatry. In his Small Catechism, Luther explains the First Commandment by saying, “We should fear, love, and trust in God above all things.” This suggests three main features of idolatry: misplaced fear, misplaced love, and misplaced trust. Of the three, Luther devotes the least attention to fear. When he deals with it he tends to treat it in conjunction with misplaced trust, instead of focusing on it as a separate issue. This makes sense, since confidence and fear are opposite sides of the same coin. Therefore I will not dedicate a separate chapter to fear, but will deal with this theme later in this chapter. Luther spends more time focusing on misplaced love and misplaced trust. These are the two main ways we can turn ourselves into idols in relation to our Creator. First, we can love ourselves above everything else, so that we seek our own wellbeing above all, and use everything including God to serve ourselves. Second, we can trust in ourselves above everything else, so that we rely on our own ability to secure the good things of life instead of trusting in the Lord to provide. In this chapter we will focus on trust, and in the next on love. When Luther discusses idolatry in the Large Catechism he focuses exclusively on trust, and most of his examples are of idols that function in the domain of the First Article of the Creed. That is, they are things that we use as substitutes for the Creator and his work of providing for our earthly needs. For instance, Luther talks about money, and how common it is to turn this into an idol by thinking that as long as we have money we do not need God, because our wealth will provide all we need. As we will see in subsequent chapters, Luther also speaks about the idolatry of misplaced trust in relation to the other Articles of the Creed. Yet idolatry that supplants our trust in the Creator’s provision is the most obvious form of idolatry, and a good place to begin our discussion. For Luther, what does it mean to have God as our God in this area of our lives? It means to trust in our heavenly Father to provide us with all the good things we need for this earthly life. This means that all who think they can provide for their own creaturely needs without relying on him have put themselves in his place, and are idolaters. It is true that God frequently uses human labor and its fruits—such as science, technology, medicine, and economic development—to provide us with earthly blessings. Yet this is just one tool in his limitless toolbox, and does not belong in the place of God. What else is all our work to God—whether in the fields, in the garden, in the city, in the house, in war, or in government—but just such a child’s performance, by which He wants to give His gifts in the fields, at home, and everywhere else? These are the masks of God, behind which He wants to remain concealed and do all things. This means that in daily life, we are constantly dependent on God’s good work to supply our every need and must live by faith in his provision. To think we can provide for ourselves, without at all times relying on him, is an idolatrous deception. SC I 2 = WA 30/1:354. LC I 5–12, 18 = WA 30/1:133.17–134.17, 135.1–6. LW 28:180; WA 46:493–95; 49:423.10–12, 434.16–18; Oswald Bayer, Martin Luther’s Theology: A Contemporary Interpretation, trans. Thomas H. Trapp (Grand Rapids, MI: Eerdmans, 2008), 106–12. That These Words of Christ, “This Is My Body,” Etc., Still Stand Firm against the Fanatics (1527), LW 37:63 = WA 23:142.2–3. That These Words of Christ Still Stand Firm (1527), LW 37:60 = WA 23:136.32–33; cf. Acts 17:28. LW 1:53–54 = WA 42:40; LW 1:126 = WA 42:94–95. 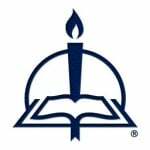 Commentary on Psalm 147 (1530), LW 14:114 = WA 31/1:436.7–11. Selected paragraphs from chapter 4 of The Unholy Trinity: Martin Luther against the Idol of Me, Myself, and I, pages 43–45. Copyright © 2016 by Michael A. Lockwood. Published by Concordia Publishing House. All rights reserved. 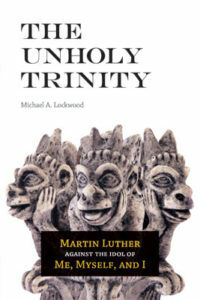 To order The Unholy Trinity, visit www.cph.org or contact CPH at 800-325-3040.